Whether you chose to full update your bathroom with new flooring, new fixtures and new lighting or just want to remodel a bathroom with some updating we can help you achieve your goals. Della-Calce Contracting has a large selection of bathroom products to choose from to give you ideas for your bathroom design. We carry a variety of flooring tile and fixtures for you to choose from including glass, stone, porcelain, wood and ceramic materials. To fully remodel a bathroom it includes switching out all of your major fixtures including your bathroom vanity, sink, bathroom cabinets but also paying attention to the small details like the perfect lighting fixture and toilet(s). 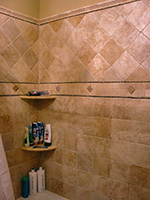 Our architects will ensure that everything you want and need is included in your bathroom remodel. If luxury is what you're looking for we have a large selection of saunas, spas, whirlpools and jet tubs to make your bathroom a relaxation paradise. We can design the bathroom of your dreams today, whether it's creating your personal oasis or renovating to increase the resale value of your home.